Leapfrog hosts dozens of clients on our private cloud and we build private clouds for clients who need a cloud of their own. It sounds somewhat magical, but for our engineers, it’s what they do every day. Typically we frogs don’t like to croak about our achievement but our private cloud is second to none. We have made a considerable investment in building a superb cloud computing platform that’s secure, resilient, available and far more advanced than what others offer or what most clients can afford to build on their own. If you need a cloud with up to 75 desktops, our cloud is a great choice. A private cloud is basically an in-house cloud computing platform. Since it’s in-house (our house, your house or even a third party’s house), it’s designed with custom features and security, and it offers far more control than public cloud services. If you have a business with multiple locations or one that uses applications that are not well suited to shared platforms (such as proprietary manufacturing applications), having your own cloud may be the best solution. The same goes if you operate a business that uses highly sensitive data and where seconds count — financial industry and healthcare companies often need their own clouds. Having built our own amazing cloud and dozens of private clouds for clients, our engineers are super-qualified to custom design and build your cloud from the ground up, managing it as part of your managed IT services. Leapfrog has been in the cloud business since 1998 and has been managing our own private cloud since 2005, before most managed IT services providers knew the difference between a hypervisor and paravirtualization! To us, private clouds are normal, not new. And we maintain, improve and spit-shine our cloud — and our clients’ clouds — on a daily basis. About 30% of our clients use our private cloud and colocation services in our Georgia or Texas data centers. That percentage is growing all the time. 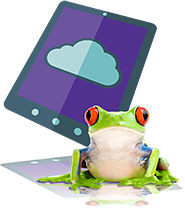 And when it comes to integrating private clouds with the rest of your IT ecosystem, you can count on us frogs for a turbulence-free experience.